In recent past we have seen gold prices coming down and it is predicted to come down further by the year-end. where as wine as an investment is gaining momentum and expected to increase further,as per Bloomberg news. Enjoy this guest post which discusses this matter further. Gold and Wine that have been tracking each other’s prices for over a decade have finally diverged. As a result, it is essential to analyze the reasons behind this trend as several investors are losing faith in bullion. The gold and wine prices have been tracking each other for well over a decade now. However, the demand for these assets is now diverging from their former trend, as the gold bullion slumped down into a bearish market. Investors have been losing faith in the yellow metal as a storehouse of wealth. In the previous 10 years, the LIVX 100 which is the premier index for fine wine, rose over three times while gold went on to gain four times for the same duration. While experts are of the opinion that the yellow metal may drop to about $1000 an ounce by the end of the year, leading to a 21 percent loss, the outlook for wine on the other hand is much pleasant with an expected rise of about 8 percent by 2014. Over the past decade, the bond yields were tumbling to a low bottom, the equities too were spiraling down, and the central banks all over the world were busy flooding the markets with unprecedented levels of quantitative easing. Gold on the other hand held firm with gold ETFs that exceeded the reserves of almost all the Central Bank reserves of the world. It is important to understand what the deviation of these physical assets actually means. 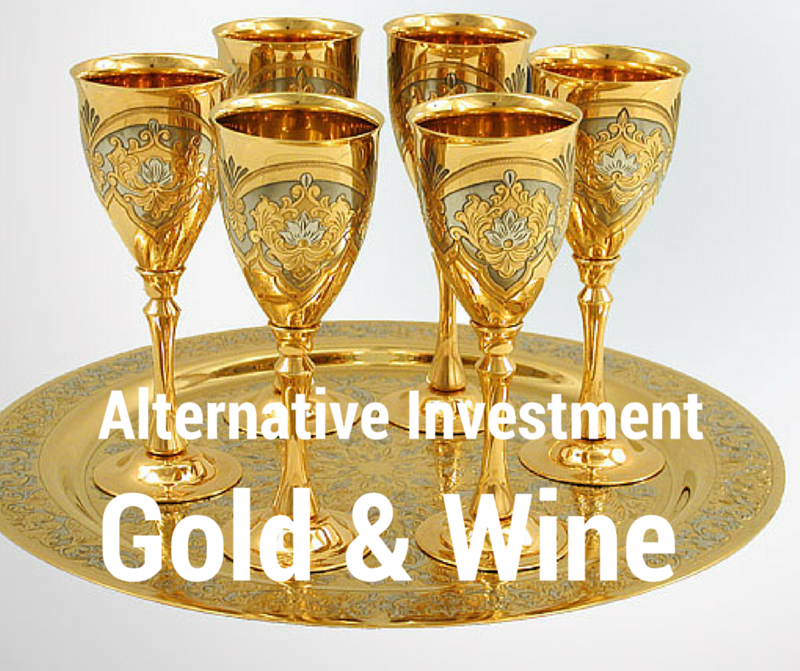 It is well understood that both Gold and Wine are two different commodities with a unique intrinsic value pertaining to each asset. However, the general trend in a poor economy favors wine. This is exactly what we are observing at this juncture, as the governments worldwide are busy flooding the markets with paper currency. This is something that may lead to a severe inflation if not checked in time. The value of gold fell for the first time in January this year, after having the longest bull market in over 9 decades. Later this April, the prices slumped below the previous low observed in September 2011. Wine on the other hand lost by about 29 percent since 2011, and currently is priced at about 276. Experts believe that it may scale up to about 300 by the end of this fiscal year. Both wine and gold began 2013 with about 3 percent drop for S&Ps and about 10 percent gain in MSCI. As per the LIVX 100, which tracks over 100 prominent and sought after varieties of wine, the fine wine trade has been valued at over $4 billion globally. About 9 to 10 percent of this value is transacted through auctions. Gold on the other hand, is traded at an average of about $34.5 billion on a daily basis. Experts are of the opinion that if the present trend continues, the precious metal may trade well below the $1000 mark in a matter of only 5 years. Similarly, they also opine that the rally in wine will not continue for a long time, as the current rise in the prices is probably due to the correction in the prices. I don’t have investment in gold or in wine. It would be interesting to see how wine as an investment would do. I previously posted Gold or Silver as an investment option. Honestly I didn’t know about wine investment prior to reading this article. I may have to do some more research on wine investment. Loosing value of gold is actually good news for me. We can continue to invest in gold as long as it is in affordable range. Here’s my question to you, do you have any investment in wine or gold? Are you planning to shuffle your investment to go with the new trend? I still think that gold will go up in long term and all this selling is just overreaction. Investors expected inflation and they think it didn’t happen. But just look at the prices in grocery stores, gas stations and other goods out there. And I believe we haven’t seen everything yet. Where the money are flowing now? It is not bonds, it is dollar! They are buying dollar which in my opinion is a future bubble. People like Bernanke and Soros want dollar trashed, so from the long term perspective, this is not sustainable. Well, it may take time before gold starts growing again, it may also be quick. For me it provide a great buying opportunity and i will be adding more shares to my portfolio. Never thought about wine as an investment since we don’t know what is good vs bad vs great. Would end up being a waste of money at this point simply because we have no idea what we would be doing. I would still like to get into purchasing some gold but not right now. Still a little too pricey for me. But at the right price it would be a bargain and gold tends to always bounce back. Seems like every other investment avenue out there wants to replace the authority of gold as a portfolio diversifier and safe-asset. I stumbled upon a post about SWAG investing. Wondering what’s that? Find it out for yourself. Hope it proves of interest. Umm. *your*. You can drown *your* sorrows…. I agree with Micheal! If the value of wine goes down, then down the bottles! I’d rather invest in gold since it would be much easier to store and less tempting to consume. I wouldn’t consider wine as an investment either. Didn’t even know that had an ETF for it. But I’m not a big fan of alternative investments, as my equity portfolio and rental properties have done quite well over the last half a decade. I disagree with the idea that a poor economic times favor strong wine prices. When the economy is down, people won’t have the purchasing power to buy wine and alcohol. The same cannot be said about gold because this precious metal tends to increase in value during inflation and tough economic times.